All businesses are required to post federal labor law posters in a workplace common area frequented by employees and applicants. 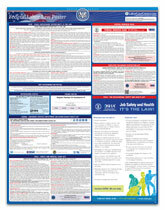 The posting requirement for each individual federal labor law poster is required by the Federal government. Failure to abide by posting requirements places an employer at risk, and may lead to employee disputes among other complications, including costly fines and penalties. It is highly recommended to post the federal laws in a Spanish version if 5% or more of your workforce speaks Spanish as a primary language. In some states, it’s a mandatory requirement. 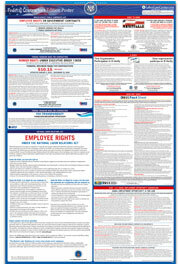 For your convenience, we provide two poster options to help satisfy your federal posting requirements. 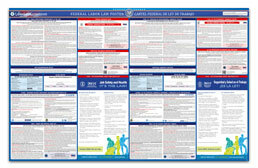 These include: Our Federal Labor Law Poster, which is available in English or Spanish, and our Bilingual Federal Labor Law Poster, which includes postings in both English and Spanish. In addition to the federal labor law posting requirements, federal contractors and their subcontractors have separate posting requirements that must be met as well. To offer a convenient option for contractors and subcontractors of the federal government, we combined the most highly required postings on our Federal Contractors Edition Poster. This poster is also available in both English and Spanish. High-quality laminated poster, size 20" x 26"
High-quality laminated poster, size 11" x 17"
High-quality laminated poster, size 40" x 26"